We were in Pathos 10 years ago and it has changed so much for the better, now all padestrionised in the harbour area. Lovely cafe's and shops to browse. ( Watch out for the time share tout's).Take a local bus to the market in the old town it's worth it,also the open top bus trip around pathos shows you all the ruin's. (take's an hour). 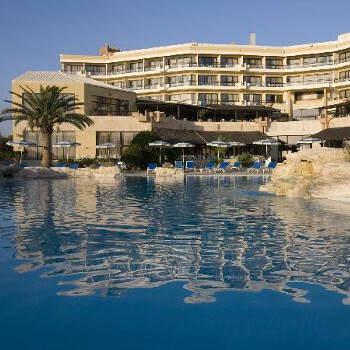 The hotel is situated outside Paphos midway between Paphos and Coral Bay on a very rocky area of the island. As with most of Paphos and Cyprus for that matter the surrounding areas look a bit like a bomb site. Not much entertainment there apart from the bar down by the main road, but some nice restaurants there as well, especially the pizzeria by the bus stop. Beach is practically non-existent and walk into the sea is very hazardous in view of rocks/slippery sea floor. Paphos is a very nice resort.The harbour is buzzing at night and its great to get a drink and people watch.Didnt venture near bar street,think we are too old!!! Beaches are not great but we prefer the pool anyway.The coastal path runs down from the harbour at the back of the big hotels.There are a few places to do watersports.Bus services are excellent.Paphos is an excellent choice for a family holiday. The resort was very clean,we didn't look for entertainment so can't comment.The beach outside our hotel was very gritty and coarse but the boys prefer the pool so it wasn't a problem.There were a lot of rocks under the water which made it difficult to enter the sea,,but there was a jetty at the next hotel that we could use if we wanted. Paphos is a really nice place but watch out for the touts selling timeshares, if anyone comes up to you and produces a scratch card walk away. The beach in front of the hotel is ok, sea weed is always there,although the hotel does clear in the morning. The natural curve of the bay is ideal for swimming and the hotles have extended the pathway and it makes a pleasant walk in the mornings. In Paphos there are plenty of fantastic restaurants and bars, the harbour at night is beautiful and it is just so relaxing to sit and watch the world go by. We are now smitten with Cyprus. The hotel is located on the outskirts of Paphos so is a little walk into the main area, however, there are plenty of bars, restaurants and supermarkets in the vicinity. The mexican accross the road is particularly good. Plenty of watersports are available from numerous places along the beach, but they are quite expensive.